In each of your bulletins you will find a piece of paper about the size of an index card and I would like you to hold it in your hand. We’re going to have some time for silence, and during that time I want everyone to write down the name of one person that you are currently in conflict with. Maybe your mother-in-law has been driving you crazy with her relentless need to tell you how to raise your family. Perhaps your boss continues to heed your advice, but then takes all the credit when things go right. Maybe your son has made some poor choices and you can’t remember the last time you had a decent conversation about anything. Perhaps one of your best friends is letting their backwards political opinions isolate them from what it means to be a decent human being. Maybe your pastor has been preaching all sorts of sermons that you definitely do not agree with. So take a moment, and write down a name. No one will see it but you. When you’ve finished, I want you to hold the card in your hand for the rest of the sermon. In the year King Uzziah died, Isaiah saw the Lord sitting on a throne. God encountered the soon-to-be prophet in the midst of something important. Uzziah was an arrogant ruler, and his arrogance led to his death. Even though his reign brought economic prosperity, he neglected to respect the temple and the worship of God. It was at this particular time, in the wake of Uzziah’s death that Isaiah was called to speak. Isaiah was confronted with the utter and radical holiness of the Lord. With wind spinning, floors shaking, and voices trembling, Isaiah is struck with the realization of his own unworthiness and the unworthiness of his people. Have you ever felt unworthy when confronted by something greater than yourself? When I saw my wife Lindsey walking down the aisle at my home church to meet me at the altar for the covenant of marriage, I felt completely unworthy. When I held Archer and Abram Pattie in my arms above the baptismal font and brought them into the fold of God’s kingdom, I felt completely unworthy. Every month when I serve communion here at the front of the church, I am met with eyes of Christians who have lived far more faithfully than I ever will, and I feel completely unworthy. God’s majesty, whether through the beauty of creation, a call vision, or the people in our lives often leaves us feeling pretty feeble. When we discover the divine we can only feel that much more mortal. When we encounter the infinite, we are reminded of our finitude. When we meet the living God, we can’t help but wonder about the lives that he gave to us. God’s call is frightening. God calls the young and old, men and women, to abandon their former and sinful ways to live fully in Christ. God called a young prophet to speak harsh truths to a community that had grown far too complacent. God continues to call all of his children to be prophetic with our words and our actions. The call is frightening and scary enough. But when we respond, when we answer the call, the real trouble begins. This whole story about Isaiah’s call is a lot like what we do in worship. We come together to praise the almighty God, we pray and confess our unworthiness, and then seek forgiveness. We pray for God to give us the grace and strength to hear the Word with faith so that we can respond accordingly. How we worship matters because it shapes us into the disciples we are called to be. Every Sunday is like Isaiah’s call. We meet the Lord in the words from scriptures, prayers, hymns, and our brothers and sisters. Through that encounter we are called to live out our faith as soon as we depart in a way that will make God’s kingdom reign. All of these things that we do on a weekly basis, they are done to attune us to the voice of God who speaks into our lives. The prophet was called to speak during a particular time, to sinners in the midst of sin. If we hear something from God’s Word today it should be a similar call. We should not be afraid to names the sins of our time, just as Isaiah did when he confronted the people’s political arrogance, spiritual pride, and economic injustice. Abraham had to confront the Lord who promised to make his descendants more numerous than the stars. Jacob had to confront his twin brother Esau who sought to kill him for stealing his blessing. David had to confront King Saul who was jealous of the Lord’s favor. Isaiah had to confront a people who neglected to thank God for being the source of all their blessings. Jesus had to confront a religious elite who no longer practiced what they preached. Peter had to confront the gentiles and welcome them into the fold of the church. Paul had to confront his own sinfulness and call others to do the same. Christians, for centuries, have been called by God to confront the conflict in their lives. To be faithful is to meet the outcasts where they are and show them love. To be a disciple means a willingness to forgive people when they have done something wrong. To follow Jesus means having the courage to ask for forgiveness when we have done something wrong. What situation are you in right now that God is calling you to confront? 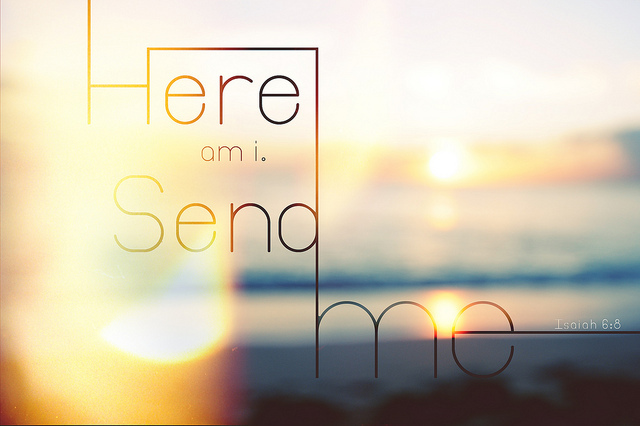 I believe the holy Lord of hosts is personally addressing each and every one of us in the scripture today. Who do we need to call out? Where are the conflicts in our lives? In each of our hands we have a name that represents a conflict in our life. Some of them can be confronted with a phone call or a conversation. Some of them can be confronted with our willingness to forgive a wrong that was done toward us. Some of them can be confronted with the simplest of gestures. It might not go well. If we take the first step to confront one of our conflicts, it might blow up in our faces. But the longer we let these names stay on paper, the longer the conflict will keep us from fully living out our identities as disciples. The longer we let the conflict simmer, the longer we will be people of unclean lips living amidst unclean lips. The longer the conflicts remain, the harder it will be to hear the living God speaking into our lives. 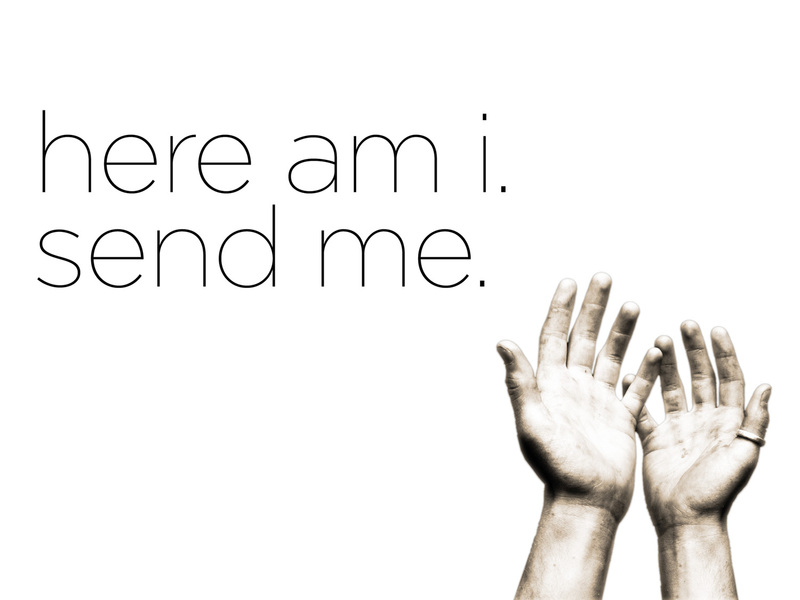 The voice of the Lord is saying to all of us, “Whom shall we send, who will go for us to confront the conflict?” Our answer should be the same as Isaiah’s, “Here am I, send me!” Amen. This entry was posted in Old Testament and tagged Conflict, Confrontation, Here, Hope, Isaiah, Jesus, Listen, Old Testament, Preaching, Prophet, Send, Sermon, Truth, Value, Work, Worship. Bookmark the permalink.